In 1985, Eddie Thompson - a man who would later in life have an even bigger part to play in the history of the Club - held a managerial position at Dundee-based Watson & Philip, the company who at the time owned the VG chain of convenience stores. They had been advertising in the match-day programme and pitch side boards since the early 1980s, but Eddie was instrumental in negotiating United's first ever shirt sponsorship deal in the lead up to the 1985 Scottish Cup Final, where the brand's VG logo appeared on the shirts for the first time. The deal was for two years, and during that time the convenience stores logo would be seen throughout Europe. United entered their eighth year with Adidas as kit manufacturer, with a new design that would also last two seasons. The tangerine Home top had a diagonal lined pattern throughout the material, and the black V neck collar had tangerine and white trim, as did the black cuffs. The three Adidas stripes that used to run down the length of the sleeve were now only on the shoulders. The black shorts and tangerine socks carried on the look of previous kits, with the now familiar three Adidas stripes appearing on both. 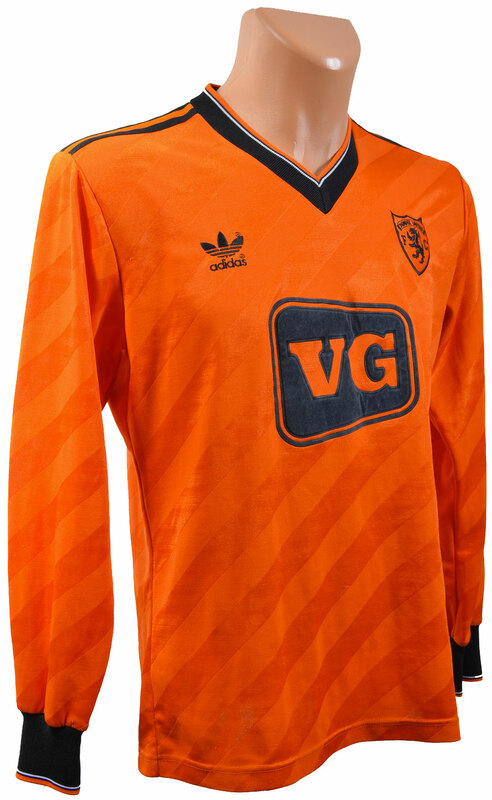 This kit made its first competitive appearance in a 0-1 defeat against Rangers at Ibrox Stadium in the opening League match of 1985/86. The season finished in dramatic style, with Celtic beating Hearts to the Championship on goal difference, but United were also in contention right up to the second last game. However, it would be the kits second year though that would see it become legendary, as the team reached the Final of the UEFA Cup after famous victories over Barcelona and Borussia Moenchengladbach. The strips last appearance was the emotional night at Tanandice where United drew 1-1 with Gothenburg in the 2nd leg of the UEFA Cup Final in the final match of the 1986/87 season. An extra note of interest is the change in size of the VG logo during the two year contract - this wasn't something that changed over time, it was sometimes noticeable from week to week. The idea of clubs selling shirt sponsorships grew popular in the early 1980s, however British TV companies originally refused to broadcast matches that featured sponsored shirts. By 1983 the broadcasters had given way and allowed sponsored shirts to be shown, but only at a limited size. Therefore United released a version of the shirt with a logo approximately half the size of the original, and this version was also the style used on the replica jerseys sold to the fans.